Booking the OET Exam: 5 Things You Need to Know Want to supercharge your OET online course review experience? Establish your test date. Knowing when youâ&#x20AC;&#x2122;ll take the exam will do wonders for your OET preparations. Itâ&#x20AC;&#x2122;ll help you avoid procrastination, improve your study drive, and promote better time management. So, schedule the test as soon as possible. Here are some of the things that you need to consider when booking the exam. 1. 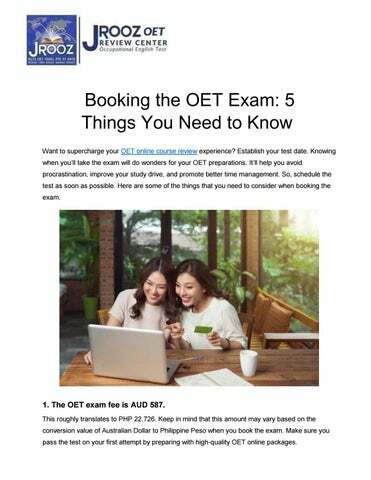 The OET exam fee is AUD 587. This roughly translates to PHP 22,726. Keep in mind that this amount may vary based on the conversion value of Australian Dollar to Philippine Peso when you book the exam. Make sure you pass the test on your first attempt by preparing with high-quality OET online packages. 2. OET exams are usually held on Saturdays and Sundays. Visit the Occupational English Test’s official website for the exact dates. Enroll in an OET online course review that ends near—or, doesn’t end until after—your chosen exam date to supercharge your performance. 3. You can take the OET exam in seven cities in the Philippines. Specifically in Iloilo, Baguio, Mandaue, San Juan, Manila, Makati, and Quezon City. Pick the city closest to your area. When you book the test, you’ll only get to pick the city and general testing area. OET will let you know of your venue’s exact address a few weeks before your exam date. Payment details – For credit cards, OET only accepts Visa, Mastercard, and payments processed through SecurePay. OET also accepts Bank Cheques or Money Orders provided that they are in AUD and drawn on an Australian bank. A digital passport photo – Follow the OET’s photo guidelines. 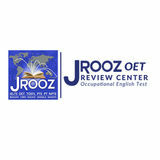 Complete the following requirements before committing to an OET online course review. That way, you can focus more on your training sessions. Register in the OET’s official website. Make sure all the details you provide matches with the identification documents you’re going to submit. Select the test date and venue you want. Choose the time and place that’s most convenient to you. Pay for the exam. Proceed to the Checkout and enter your credit details. Double-check everything before paying for the test. Make sure is correct to avoid any issues when you take the exam. reach—and exceed!—your OET grade goals? We have what you’re looking for. Click here to find out more about our OET online packages and be the next OET passer!